What’s always amaze me is her cleverness and observant skills on every scale. Not to mention her professionalism in managing circumstances, people, and atmosphere of the premises while maintaining full services and hospitality. Plus, the part she salutes and bid cordial goodbye to anyone arriving or leaving, within her sight. She conjures up drinks beautifully brisk and efficient without losing details. She stirs and strains neatly with appealing thin arms and finger poses. 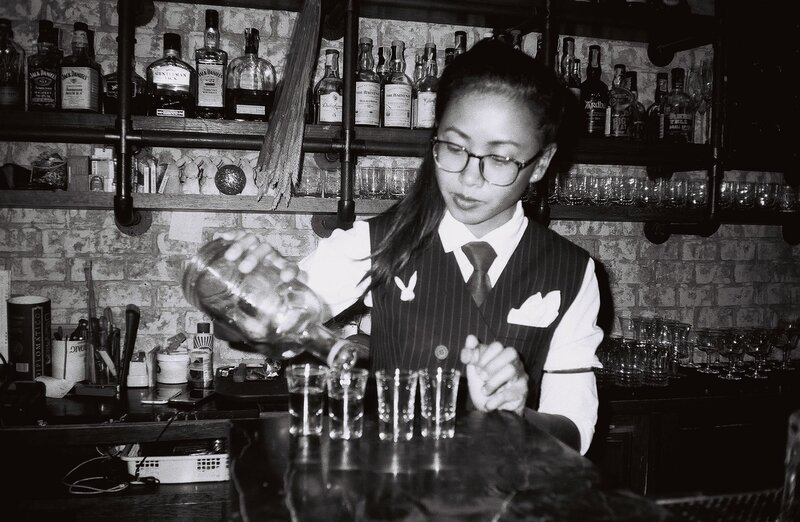 Shaking and throwing are also short and vigorous but what smooths out the overall drinking experience is when she tells stories about spirits and cocktails or answer any of your questions calmly and intently. Okay, She can be quite frank sometimes but always with manners. Her drinks are mostly very boozy, minimally presented and are rich in flavors. Please note that she can be quite lethal when it comes to shots. Always ready to subtly giving out tons of shots or even deadlier, seconds pour. Nonetheless, her wide smile and lively giggle from a conversation are enough to lift you up a bit before taking a sip. Additionally, absinthe is one of her favorite things. And personally, it’s tough to find one that likes it.